Note that we invert what you might expect to write, to take advantage of short-circuit evaluation. Groovy and java will not evaluate the second clause if the first part is true - it’s unnecessary because true || false is true. So what we’re saying if the resolution is not fixed, the transition is OK…​ otherwise the second part is evaluated which says that there must be at least one fixVersion. You could instead write issue.fixVersions.size() > 0 but it’s clearer to take advantage of groovy truth, which says that a non-empty collection is evaluated as true in a Boolean context. Validate that a particular resolution value is chosen. You might want to combine this with a check on the action name. You can select the field to receive the error message according to what makes most sense to your users. You can check for changed fields by calling methods on originalIssue, which is the issue as it was before modifications made during this transition have been applied. Make sure the message you provide is descriptive so as not to infuriate users. Also ask yourself if you really need to request a comment for this change. cfValues['My Single Select']?.value == "Some value"
cfValues is a map-like structure where you can get the value of any custom field on the object. Note that the keys are the field name, and not id. Here is a more complex example. We have a custom field SelectListA. We want to validate, on creation of a sub-task, that none of the other children of the parent have the same value for this particular custom field. You could imagine such a scenario in an "ordering process" or something. Although one-liners work fine, you can put any amount of code in the Condition field. 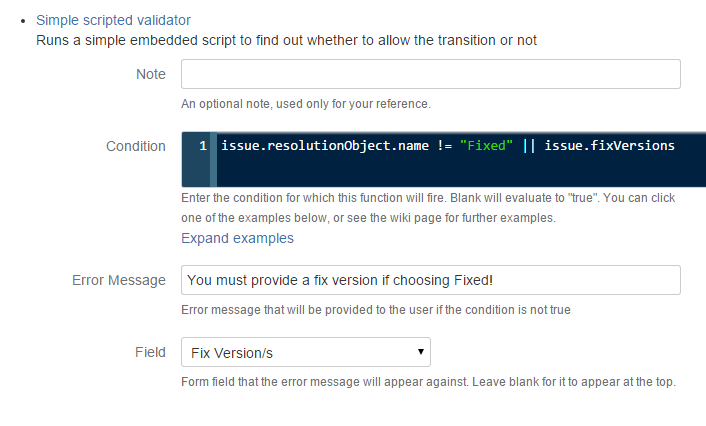 If you don’t explicitly include a return, the result of the last statement executed defines whether the validator accepts or rejects the transition. The attachment must have existed previously on the issue before the transition was applied. If you have the Attachments field on the screen, you cannot get newly added attachments in this way. use a different method to get newly-added attachments. To check custom field values of subtasks, cfValues is not available, so you must use custom field manager to get hold of the custom field object. This is demonstrated in Checking sibling subtasks. !issue.isSubTask() || issue.parentObject.statusObject.name == "Open"
The first clause is unnecessary if you are applying a workflow only to a subtask type(s). However if you don’t, calling parentObject.something on standard issue types will throw a NullPointerException. If you have the Issue Links field on a form, and you want to validate links that have happened on this transition, follow the examples at Validating Links Added this Transition. Cascading selects will return you a Map<String,Option>. In the following examples, CascadingSelect is the name of a, you guessed it, cascading select field.